If you have a 'fact' or a 'question' that is somehow related to The Jungle Books and you don't now where or how to put it in this wiki, this is the place. Just click 'Edit' on the top-right or bottom-left corner of this page. I am a linguist working on the different translations of The Jungle Books. I have a question in connection with the German translations. As far as I know in 1951 a German edition was published under the name of Dagobert von Mikusch, but he actually did not translate the book only reedited � or something like that � an earlier German translation. I would like to know whether my information is correct or not, and if yes whose translation did he reedit. I came across your site, and I have a question. I have a copy of Mowgli the Jungle Boy by Rudyard Kipling. It was published in 1951 by Grosset and Dunlap, hardcover, and is illustrated by William Bartlett - the same as one of the books pictured on your site, but the two books have different covers. Do you know if the book was published with two different covers? Any help would be great, thank you! 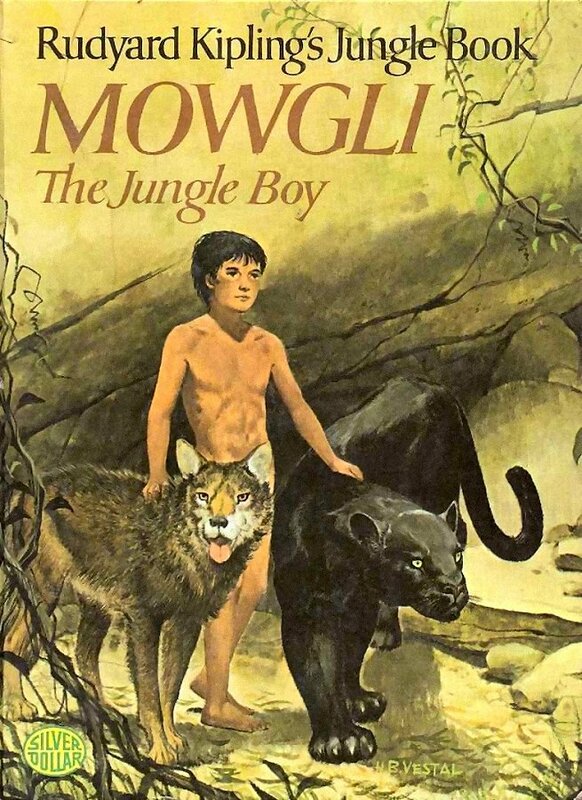 ANSWER: Mowgli the Jungle Boy was indeed published with two different covers. The original cover is by William Bartlett who also drew the interior artwork. It was later reissued with the same interiors but a new cover by H. B. Vestal. These thumbnails link to bigger versions. I have been searching for a photograph that I saw a few years ago. I can't remember where, a magazine I think, but for me it is an insight into how much fun the cast seemed to be having making the film. It showed Phil Harris and Louis Prima singing together in or in front of the orchestra pit. On the screen in the background, Baloo (disguised as a monkey, grass skirt etc) was dancing with King Louis. Looking at the orchestra members you can see that their jackets are off; ties are loose; some are standing, but they are all having a ball. I don't know if you are familiar with this photo but if you could give me any information about how I may be able to track it down I would be very grateful. Hello, I have been trying to buy the complete series of Jungle Book on Video, by complete series I mean the NIPPON series that once aired on television. I cant give too much info about it but I really would like to complete the set. Could you possibly give me some links to places I can buy them in pounds? I can find many links to buy them in dollars but being English I dont have any dollars! Illegal postage stamp issues produced in the name of the Republic of Benin including a set of three individual postage stamps, each depicting a scene from a different tale, "Puss in Boots", "A Thousand and One Nights" and "Mowgli". Each stamp has a value of 1,000f and is inscribed "POSTES 2003". 2005 04 27: Character converion is wrong at jbc:2393. Mrs. (Flora Beal) Shelton , a missionary in Batang, brought out, in the 1920s, a geographical encyclopedia in the Tibetan language, printed at the Baptist Mission Press in Calcutta . According to older Tibetans who had come across this amazing book, it not only gave accounts and pictures of Eskimos and igloos, pygmies from �Darkest Africa� and so on, but even featured detailed descriptions of places in Tibet with photographs of the Potala and the great monasteries of Derge and Lithang. Mrs. Shelton also published a collection of fairy tales she had translated, titled, appropriately enough, Lhamoe Namthar (�goddess stories). This book also included the story of �Rikki Tikki Tavi� from Kipling's Jungle Book . Mrs. Shelton wrote to Kipling, then living in Brattleboro , Vermont , for permission to reprint the story. In the preface to the first edition (1922), Mrs. Shelton wrote: �To the boys and girls of Tibet this little book of stories lovingly given with the hope that they may enjoy them as much as my own two little girls, Doris and Dorothy have done.� This book was later re-printed by the Tibet Mirror Press and many hundreds of free copies distributed by Gergan Tharchin to children at the Tibetan Refugee School in Kalimpong, on the Christmas Eve of 1964, if I recall the year correctly.